Though The Jay Leno Show was supposed to reinvent network TV, critics say last night's episode was just a stale remake of The Tonight Show, despite a serendipitously well-timed appearance by Kanye West. More than 17 million people watched last night's premiere according to Media Week, and Leno beat the combined ratings of the competing network show's by about 7 million viewers. However, the numbers are expected to drop off during the week, especially if critics' reviews reflect how audiences feel about the show. The Jay Leno Show, NBC has been telling us all summer, was "comedy at 10," not simply a second Tonight Show. Instead, what we got was a monologue, a couple taped comedy bits, an interview, a musical act, another interview and Headlines. Somebody refresh my memory: what was The Tonight Show again? Because clearly I was watching the wrong show all these years. The Jay Leno Show premiered last night with a big old disconnect. NBC's prime-time Jay Leno experiment has been hugely anticipated - both inside and outside the TV industry - since the move was announced in December. It has been called network TV's riskiest change in decades, one that could forever alter the nature of nightly programming. And yet there it was, seeming very, very much like The Tonight Show With Jay Leno,' brimming with the kind of safe, middle-of-the-road humor that has always been Leno's trademark. Even Leno, while delivering his opening jokes, seemed relatively unenthused about the premiere. He set forth his usual flurry of average one-liners - about Joe Biden, Nancy Pelosi, and his own ad campaign - with an ordinary energy level, unwilling to be anyone but the easygoing Jay his late-night audience already knows and loves. If he was keyed up and inspired about his new gig, he hid it well. And Mr. Leno ended his maiden show the way he started it, in his familiar silly and safe Tonight mode. So much attention — and promotion — has been spent deciphering the impact Mr. Leno's 10 p.m. slot could have on prime-time programming, and so much ink has been devoted to describing how Mr. Leno's new show would depart from his old one that it was startling to see how little difference there was. The set was slightly different, and Mr. Leno spoke with his guests in matching armchairs, not across a desk, but the content and tone of the premiere looked and sounded like any ordinary Tonight show. Leno, no more unfunny that usual, presided over a set decorated with dark wood and delicate bonsai that evoked horrible memories of paying $16 for well drinks at hotel bars. In one of the show's superficial attempts to play like something other than Tonight, Leno does without a desk, forgoing the authority a slab of lumber confers in favor of a cozier armchair setup. Thus seated, the host did not so much interview guest Jerry Seinfeld as set up his jokes. And there he was, old reliable, slapping the hands of audience members and making jokes about George W. Bush on a mountain bike. It was almost like he never left. His first comedy bit, about participating on the show Cheaters, was lame and homophobic, although having all members of the love triangle wear argyle sweaters was a nice touch. Leno's just too corny for my taste. 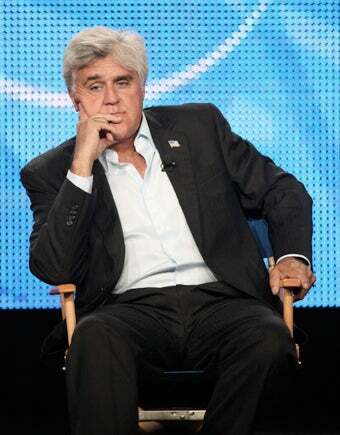 NBC is committed to airing Leno's show for two years, and all the networks are watching closely to see how it goes. All Leno needs are the same 5 million viewers he had in his late-night slot, and the show will be more profitable than what it replaced. That could mean that the future of television will be lower-budget, live-event-oriented, and possibly populated by former game show hosts. Bet NBC wishes Kanye could do Jay every day. Because without Kanye West, and his conveniently timed controversy from the MTV Video Music Awards, NBC's Jay Leno Show premiere Monday would have been even more of a cut-rate, snooze-inducing, rehashed bore. If Leno's desire is to help fans get to sleep earlier, desire satisfied... Leno had promised his new show would not be the same as the old one, but it looked awfully similar. If you found Leno's routine amusing before, you probably found it amusing Monday night. And given his propensity for repeating jokes, you'll probably find it amusing Tuesday night as well. It's not a good sign when the Bud Light commercial is funnier than the comedy show it interrupts. Sixteen minutes into the new The Jay Leno Show, it was difficult not to panic. This is the future of television? This wasn't even a good rendition of television past. Clearly Leno believes that if it ain't broke, don't fix it, and he has been very vocal about the fact that his late-night talk show was not broke. So here it is again, different time slot, busier set and same old jokes. Literally. Much like the Hugh Grant interview, the sitdown with Kanye was a little funny and a little awkward, and while it wasn't particularly illuminating it'll be what everyone is talking about in the morning. There's not much else to talk about, considering there isn't much difference between the new show and Jay's Tonight Show. There's more comedy, though it's of the bland, topical variety that Jay is known for. Jay hosted The Tonight Showfor long enough that audiences came to expect that his middle-of-the-road humore he deals in, but in the earlier time slot it feels out of place. As usual, the monologue was tepid, and a short film about a musical car wash from The Dan Band, one of the comedy correspondents in Jay's new troupe, was interminable. They said The Jay Leno Show wouldn't feel like going to bed really early, that it would feel new. But it's like going to bed really early. It feels old. For a lot of people, The Jay Leno Show, which premiered Monday in its game-changing 10 o'clock weeknight format, it might feel perfectly comfy. Leno asked [Kanye West], who sat frozen at the mention of his mother, who died in 2007. What was weird about this was how quickly West stammered through his repentance ("Obviously, I deal with hurt"), saying he needs to take a vacation from performing and the celebrity grind under which he lives, then recovering immediately to perform with Jay-Z and Rihanna, proving that really, after all the talk, Jay's show is still a place to promote your product, your song, your movie — and in special guest Jerry Seinfeld's case, your Seinfeld reunion on HBO's Curb Your Enthusiasm. Leno and his producers kept saying it wouldn't be like this, this usual shill game.